Full green nigel morocco, gilt decorated front cover and red morocco inlays, by Zaehnsdorf. 39 leaves (of 40), wanting H4; early marginalia throughout; a note on the design of binding with the signature of W.F.O. (=Walter Oakeshott); contemporary annotations in italics. 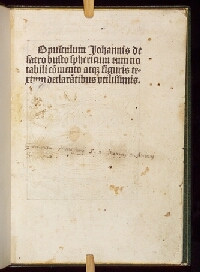 Frarum Monsterii S.S.... (signature; title page).